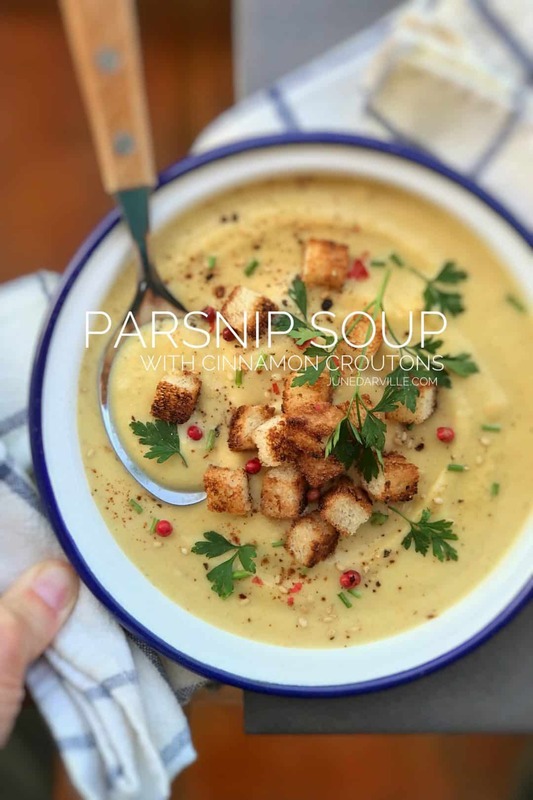 Parsnip Soup Recipe with Cinnamon Croutons | Simple. Tasty. Good. I was brainstorming about what topping I would use this time to make my picture extra drooling. I first thought about preparing some poached eggs. Cheese? No. A more exciting flavor. Mushrooms and walnuts? Maybe… How about some crunchy autumn croutons flavored with cinnamon? Now that sounds good. Cinnamon, apple, ginger and parsnip. Think this could be a winner! And a great Christmas starter also. Love parsnips? Then also check out my parsnip risotto with bacon! Warm winter flavors: my apple and parsnip soup recipe with cinnamon croutons! 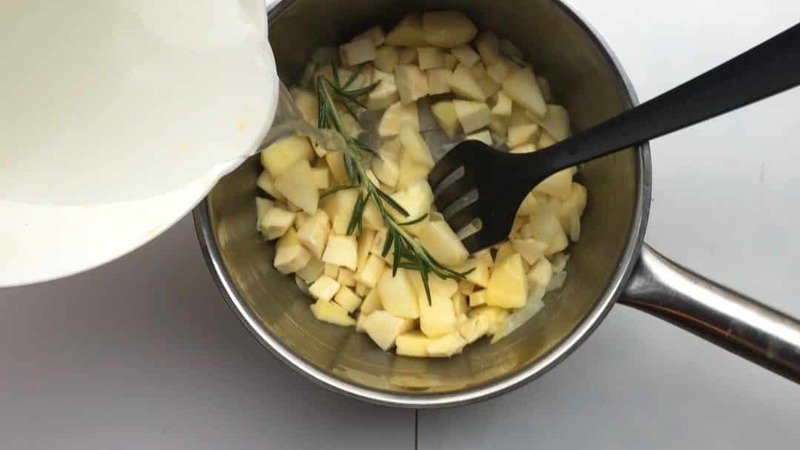 Add the onion, garlic, butter and rosemary to a large pan. 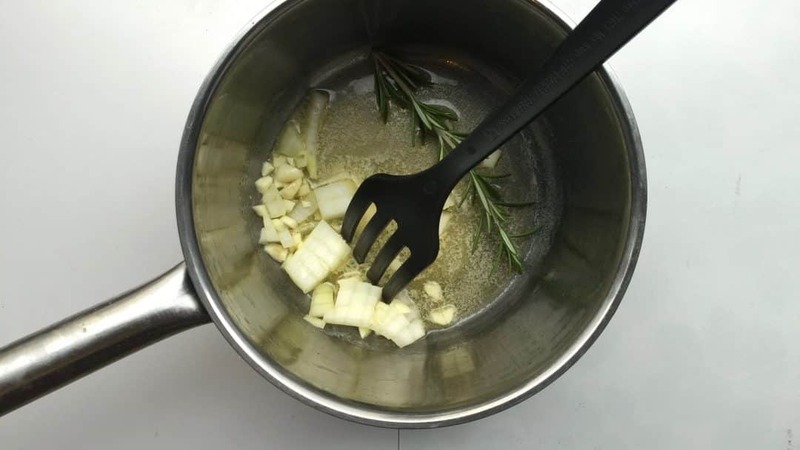 Then place the pan over medium heat and gently fry the onion and garlic for 5 minutes until fragrant. In the meantime peel and trim the parsnip and apple. Chop both into small bits. Then add them to the onion in the pan. Season with pepper and salt. 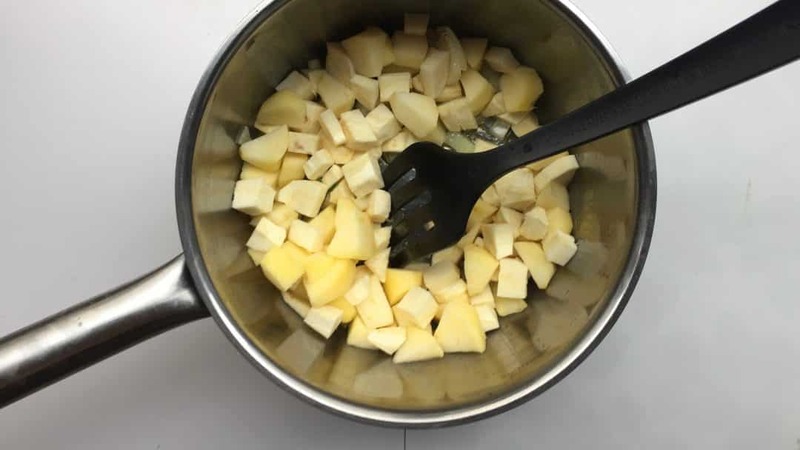 Cook the ingredients for 4 minutes. Stir regularly. Then add the stock and grated ginger. Stir well again. Cover the pan and cook the vegetables over medium heat for 8 to 10 minutes until soft. In the meantime prepare the cinnamon croutons. Dice the bread into even bits and gently fry them in some butter until golden. In the end sprinkle them with a pinch of cinnamon and stir. 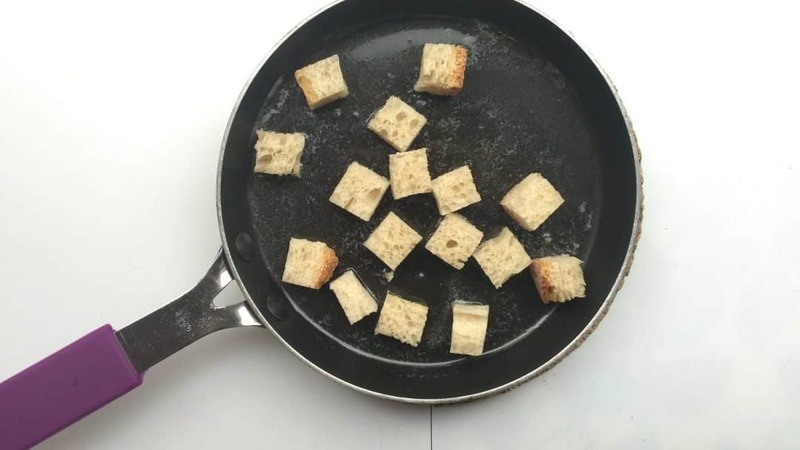 Then take the pan off the heat and let the croutons cool a little. 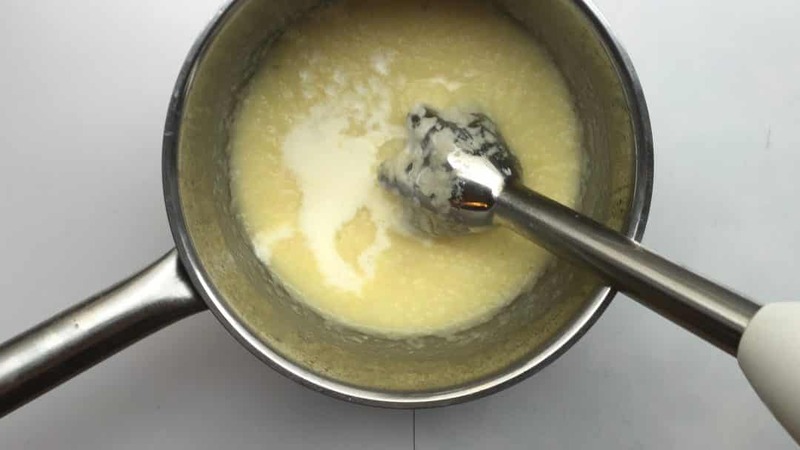 Blend or mix the soup until it is very smooth. Then add cream to taste. Stir and check the seasoning. Add extra pepper or salt to taste if necessary. 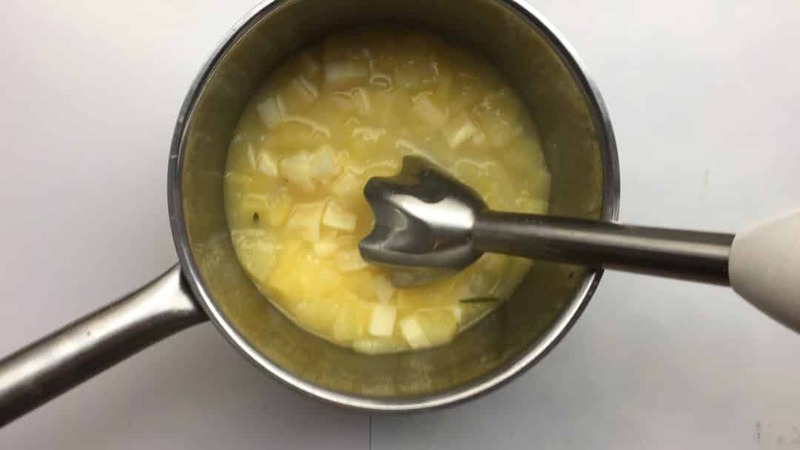 Scoop the parsnip soup into large bowl. Top with the cinnamon croutons. Sprinkle with the chopped parsley and some freshly ground black pepper. Serve the soup piping hot.